Sarah Burton debuted her first women’s ready to wear collection in Paris yesterday. I held my breath as I looked at the thumbnails of the show. I wasn’t sure what I was expecting or feeling. I certainly could empathize with Burton and the mammoth weight of expectation, anticipation, responsibility and legacy that rested precariously on her shoulders. I was happy when Burton was chosen as Lee’s successor – it was the right choice for Alexander McQueen, the entity, to make. 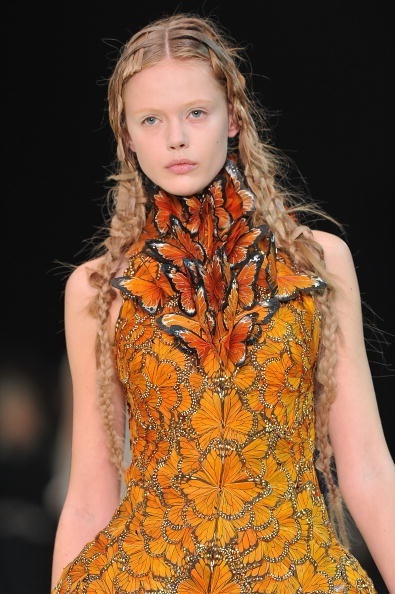 Burton had, of course, completed McQueen’s last collection and has already shown a men’s collection, earlier this year. The FW10 collection was breathtaking, but I saw so much of Lee in it – it was the last thing he was working on prior to his death. It literally brought me to tears. This would be completely Burton’s work and so, I held my breath. As I flipped through each picture, each detail, all I could see was that which was repeated from past collections and that which was missing – primarily, Lee. My view, admittedly so, is unfair to a talent like Burton – but I, like millions, adored Lee as an artist. How could there be another Dylan, another Strummer, another Pollock, another Dali? With our hearts aflutter, we awaited thee. Photo by Peter Stitger. Thank you, Ms. Burton for bearing that weight and for giving us butterflies. Over time, perhaps I will learn to love and see your work in a special way, indeed.